Look Keo Power Regular Road Pedals € 1330! RELIABLE POWER MEASUREMENT The KEO POWER DUAL MODE is the third generation of the reference design in power measurement pedals. Propelling forces are measured by 8 strain gauges. (*)IPX7: DO NOT IMMERSE IN WATER. PROTECT AGAINST SPLASHES AND RAIN. DO NOT WASH WITH A PRESSURE WASHER. This performance can be further improved after installation thanks to a simple calibration procedure accessible to all via the KEO POWER APP application. As a result of its design the KEO POWER is not affected by pedaling style nor temperature variations in a 10°C range (above that your computer will indicate the need for resetting to zero). The KEO POWER 2016 adds ANT+ compatibility through its DUAL MODE RADIO. Designed for reliability and reproducibility of its measurements, the KEO POWER also takes into account the specific problems of pros and research laboratories. Batch TCX standard raw data download for trainers. up to 2 real time analogue channels. KEO POWER EXTENSION: Instrumentation for the right pedal only: allows you to upgrade from the Kéo Power Essential to the Kéo Power Dual Mode and so increase the functionality and accuracy of your system. 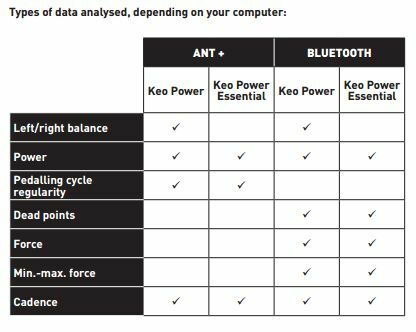 The DUAL MODE UPGRADE programme also allows you to update your KEO POWER WIND (v1) and KEO POWER BLUETOOTH (v2) to the new functionalities (operation performed by an authorised LOOK retailer). Wide platform surface: 62mm - 400mm2, for excellent pedalling stability and power transmission. Reduced stack height: 17.5 mm, for optimum movement. And of course the axle has been the subject of particular attention (3 bearings, double sealed) and subject to the same validation tests as the standard axles. KEO POWER axles are approved after 2 million cycles at 100rev/min with a 90kg load on the pedal centre and eccentric rotation (which creates a shock at each revolution). This test is greatly superior to the current standard (EN1478). Very easy to install and compatible with all bicycles. Can be moved from one bicycle to another, unlike other systems. Compatible with the majority of 2015 and 2016 cranksets, crank thickness less than 16 mm, height less than 40mm.